As in the case of hot dogs, there are several versions regarding the origin of the word “hamburger” to describe the famous sandwich filled with minced meat that we all recognize. Towards the end of the 19th century, a number of simple little restaurants in the United States already had such a dish on their menu, but it is only during the 1904 World Expo in Saint Louis, Missouri, that it was introduced for the first time to an international audience. 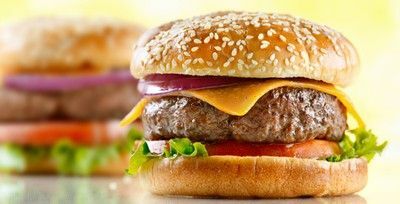 The name “hamburger” was eventually coined as a reference to the Hamburg Steak recipe – salted and slightly smoky minced meat mixed with onions and breadcrumbs – that German immigrants had brought with them from the town of Hamburg in northern Germany. Due to anti-German sentiments during World War II, the hamburger was temporarily renamed “Liberty Steak”. I invite you to try out some of our “burgers” with a twist. Originally published in the Journal de Montréal on June 28, 2014.